This team of archers were accompanied by Mr Devlin and our Chair Angela Tinning to a Premier Sports Archery event at Throckley. Our Premier coaches organised the event. The results were Throckey first; Waverley second; Simonside third and Milecastle forth. Well done all those who represented the school again. Mrs Armitage and Mr Devlin took a team of basketballers to Throckley for the Premier Sports Championship. We needed to win in the last game against Simonside by two points. Mr Hoey gave us our orders at half time - we were suffering defeat but we turned it round and won the competition! Well done the MIGHTY REDS! LKS2 took part in a sports event with other schools at Walbottle. The focus was on different athletic events - throwing, jumping and running. Our pupils worked in relay teams to get achieve the quickest possible times. What a performance from Waverley. Teachers going through the pain barrier. even Mr Thoburn had his tracksuit on! Mrs Armitage organised lots of events. We had fun with our friends. We will keep you posted about how much we raised. Outdoor education is a major part of the PE curriculum - its helps us to learn about ourselves; other people; the environment and teaches us new skills. There was lots of adventures, challenges, achievements and FUN at Robinwood! All of the children gave every activity a go with a smile. They have had a really exciting time away and they all should be really proud of themselves for representing Waverley! At the end of our Sports Week everyone got together to celebrate and award our personal bests! The ceremony started with some children from Streetburners showing us some of their groovy moves! Next some children from year 4 performed a gymnastics routine, which they learnt before the holidays! Then came the awards, each teacher picked 1 boy and 1 girl out of their class who improved the most or tried really hard with their personal best! Those lucky children were presented with a lucky gift bag from Lloyds TSB! Finally Mrs Armitage was awarded a wreath for being the Queen of PE! All hail the Queen of PE! Thank you to her for organising such a brilliant sporty week! You can see all of the photos from the ceremony on our latest news page. 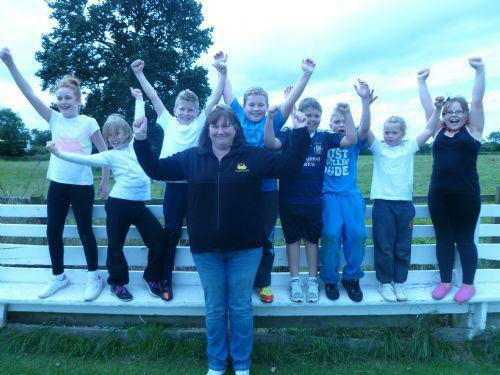 Mrs McGettrick took her class to Kirkley Cricket Club for an intensive day of coaching. The morning session concentrated upon the skills of fielding, batting and bowling. Coaches Ian Smith and Mark Douse selected four teams for the afternoon Kirkley Cup competition - each team played against the other three and by the end of the games we had a three way tie for first place. Ian counted up the runs scored in each game and the West Indies team came out on top; Australia second; Sri Lanka third and sadly England got the wooden spoon. Coach Ian was particularly impressed with how we improved throughout the day - great batting from Chloe and Lewis; super bowling from Max; Ethan tremendous in the field; fast running between the wickets from Liam but an all round good effort from everyone. We had a great day and thank Kirkley Cricket Club for allowing us to use their facilities. We are keen to get our pupils involved in clubs outside school so please follow the link to find out more about coaching sessions at Kirkley - every Friday during the summer months there are coaches on hand to coach potential players. Waverley pupils take part in lots of PE events and activites. Have a look at some recent events and competitions below.